Tomato sauce, called gravy in my Italian-American family, is something I simply do not want to live without. I now make it with only the lowest salt-content tomatoes available and have even found low-salt tomato paste. Cooking it, or rather simmering it down to its rich, luscious thickness, is an all-day process, which means when I make it I make a lot and freeze it for future use. But I recently saw a quick version fo tomato sauce on Recipe Rehab and decided to give it a try. I couldn’t get the recipe used on the show because it’s from the shows first season and those recipe aren’t on its website. But I found several variations of the same recipe for using cherry tomatoes and roasting them in an oven to start the process. I went with a version of this one, using real garlic and real onions instead of powder and leaving out the salt entirely. 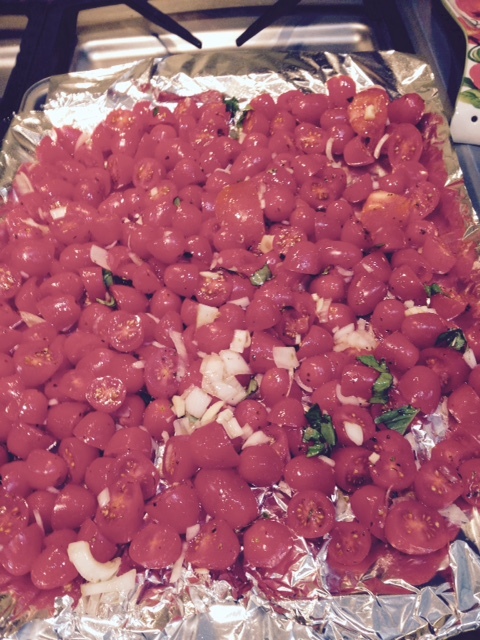 You cut the cherry tomatoes in half and roast them in the oven. Rather than add the oil and spices on top as the recipe suggests, I mix them all in a bowl to coat the tomatoes first. Once they were cooked, about 35 minutes, I put them in a blender to liquefy, then into a frying pan with some low-salt tomato paste to thicken the gravy a bit. The result is a nice light-tasting summer gravy, which we served guests over edamame pasta, a light pasta which would have wilted under a heavy gravy. It all made for a great dish, thanks Recipe Rehab!